while their vehicle is in your workshop through the use of personalised videos. Using VIDEO1st dealers can now engage customers more readily at point of enquiry by empowering them with up to date, relevant information using personalised videos, appropriate photographs and pertinent documents, websites and brochures, all delivered promptly via email and SMS. There’s no need to purchase additional, often very costly equipment because VIDEO1st will work on any internet enabled mobile device with an iOS or Android operating system and built in camera. With no initial setup costs, no contracts to sign, being device neutral and only £45 per department, VIDEO1st is extremely cost effective. Using one device, a user can capture and/or upload multiple videos and photographs into each vehicle gallery and deliver them to the customer to view at their convenience. Users will receive instant notifications as videos are watched by your customers or comments and questions added. Browse through logs for each media gallery to see how many are being sent, when they are being watched, how long they are being viewed for and what devices are being used. You may want to have your managers review media galleries before being delivered to a customer or send them straight from the device, the choice is yours. If you want to get a better angle for the next shot, simply pause the video, get ready and restart recording. The videos will be seamlessly stitched together before being sent to the customer. When recording a video, zoom in and highlight areas of interest for your customers so they don't have to guess at what they are being shown. Take photographs of areas you want to highlight while you’re recording a video to save time, with all media being sent to the customer in one gallery. 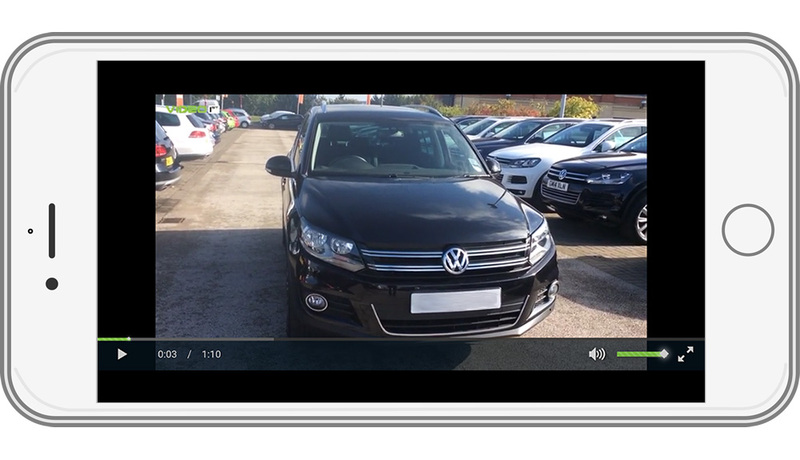 Use the VIDEO1st App not only to create personalised videos for your customers, but also to create videos for used cars available on your website which can be uploaded automatically with the click of a button. Make the videos more personal to you by burning your logo onto them, creating a unique experience for your customers. Add top and tails automatically to all videos sent from VIDEO1st introducing your dealerships and explaining the content of the video, creating a professional look and feel for all media sent to your customers. Each customer who is sent a media gallery can watch their videos and browse through their photographs on their own personalised web page. Many of generation Y and Z want to communicate electronically, so customers can ask questions or request more information using the comments area on their personalised page, with replies posted from you in a conversation format. Keep your customers informed by including links to websites or documents relating to their enquiry in their personlised page. Deliver a consistent message to your customers through both email and SMS using the fully customisable templates, each of which include a link to their personalised web page.